This morning, a demonstration took place in McLeod Ganj, a quiet Northern Indian village adjacent to the home of the Dalai Lama and the Tibetan government-in-exile. In this town on the southern end of the Himalayas, young Tibetan exiles staged a memorial for Tibetans inside China-controlled Tibet who have burned themselves alive in recent months. 11 have self-immolated since February 2009. Most are teenagers or in their early twenties. The youngest was 17. It is an expression of despair, and an act of protest against increasingly harsh Chinese military crackdown on ethnic Tibetan cultural, religious, and social systems. For a list of the names, dates, and locations, read on (and there is more background at standupfortibet.org). The demonstration was organized by Students for a Free Tibet and Regional Tibetan Youth Congress, Dharamsala. It was a very moving demonstration. 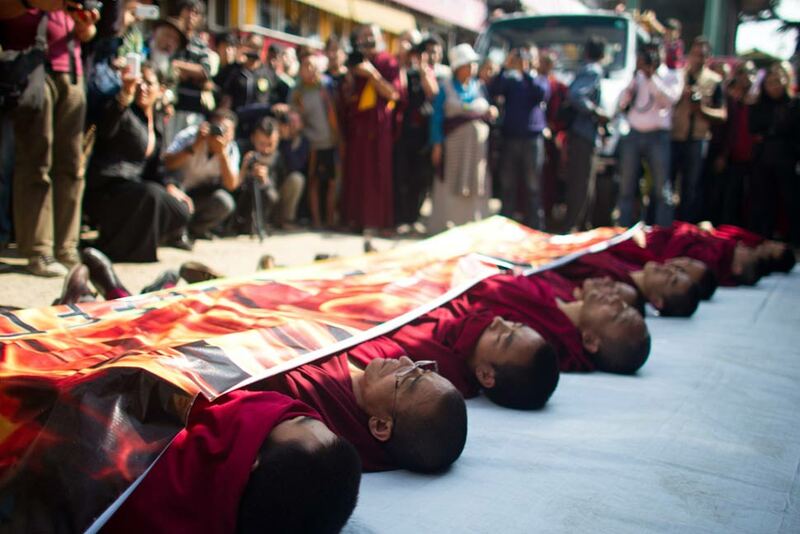 Young monks carried a graphic banner with flames in the background and the text, Tibetans are dying for freedom. 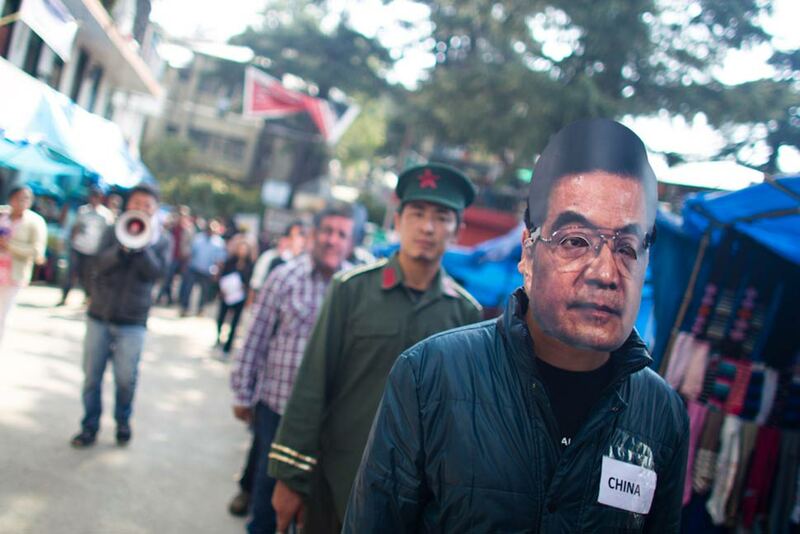 They were accompanied by demonstrators wearing masks of world leaders. The Chinese are playing this off as though the Dalai Lama is running around with a lighter and inciting the monks to kill themselves. But that couldn’t be further from the truth. Tibetans are very depressed about what’s going on. But their is a quiet respect for what the monks have done. It’s viewed as the supreme sacrifice for the Tibetan people. Below, photos, and a press release issued today by organizers. [DHARAMSHALA] Celebrities, politicians and other prominent individuals, including Nobel laureate Archbishop Desmond Tutu and musicians Radiohead have joined over 20,000 people in supporting a new campaign calling for coordinated global action to resolve the escalating crisis in Tibet, where ten young Tibetans have self-immolated since March 2011. On the eve of the G20 Summit, Tibetans and their supporters are joining a Global Day of Action to highlight a Campaign for Global Intervention, an urgent call to world leaders to exert multilateral pressure on Chinese President Hu Jintao to ease tensions in Tibet. Statements of concern following the self-immolations in Tibet have been issued by a number of governments, such as the United States, Germany and also the European Parliament. Campaigners are calling for a more coordinated, multilateral approach, including a joint demarche and the urgent creation of an appropriate and effective multi-lateral mechanism through which future diplomatic measures concerning Tibet can be agreed. Lobbying efforts have won the support of parliamentarians around the world, see www.StandupforTibet.org. 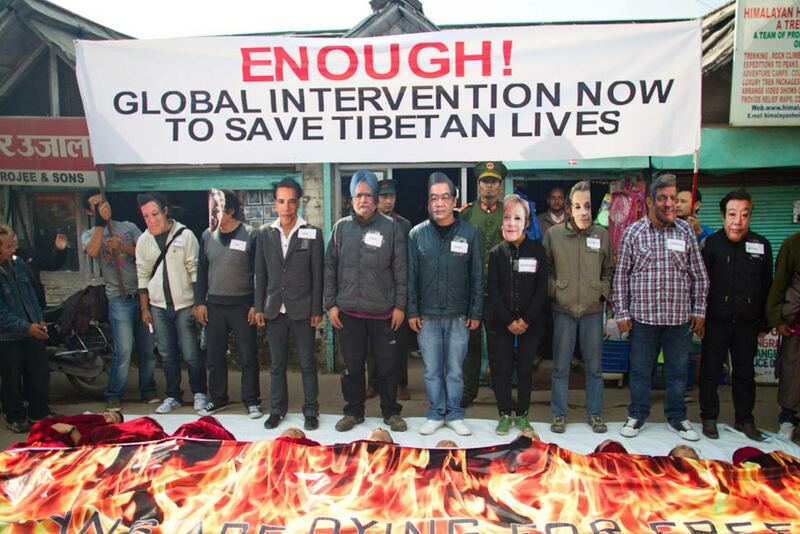 “Today, in 60 cities around the world, Tibetans and supporters are saying Enough! Enough to China’s violent, military rule over Tibet, and Enough to world leaders for failing to hold Beijing accountable for its atrocities in Tibet. Inaction now will only lead to the tragic loss of countless more Tibetan lives, and we cannot stand by and let that happen,” said Dorjee Tseten, National Director of Students for a Free Tibet India. The harsh reaction of the Chinese government authorities to the 2008 protests across Tibet and the follow-on compulsory “patriotic reeducation” or “legal education” at Tibetan monasteries. Although protests in Tibet have been initiated and joined by all sectors of the society, including students, monks and nuns are frequent targets of repression given that religious practice connected to the Dalai Lama is viewed as subversive by the Chinese government. Elements of the security crackdown in Tibet that began as a reaction to the 2008 protests are ongoing with tightened control all around the country. 2. Release all those detained in connection to the 10 self-immolations since 16 March 2011 and account for the whereabouts and well-being of all those who have self-immolated since February 2009. 3. Jointly démarche (officially reprimand)China concerning the situation in Ngaba, seeking a full accounting for the removal of monks from Kirti Monastery, including an explanation of the pretext or conditions under which monks were removed and their current whereabouts. 4. Urgently establish, with other concerned governments, an appropriate and effective multi-lateral mechanism through which future diplomatic measures concerning Tibet can be agreed. 27 February 2009, Ngaba: Tapey, mid-20s, of Kirti Monastery. Whereabouts unknown. 16 March 2011, Ngaba: Lobsang Phuntsok, 20, of Kirti Monastery. Died 17 March 2011. 15 August 2011, Kardze: Tsewang Norbu, 29, monk of Nyitso Monastery. Died at the scene, 15 August 2011. 26 September 2011, Ngaba: Lobsang Kelsang, 18, monk of Kirti Monastery. In hospital. Lobsang Kunchok, 19 , a monk of Kirti Monastery. In a different hospital to Lobsang Kelsang. 3 October 2011, Ngaba: Kelsang Wangchuk, 17, monk of Kirti Monastery. In hospital. 7 October 2011, Ngaba: Choephel, 19 former monk of Kirti Monastery. Died 11 October 2011. Khaying, 18, former monk of Kirti Monastery. Died 8 October 2011. 15 October 2011, Ngaba: Norbu Dramdul, 19, former monk of Kirti Monastery. Taken away, whereabouts unknown. 17 October 2011, Ngaba: Tenzin Wangmo, 20, nun of Ngaba Mamae Choekorling Nunnery. Died at the scene, 17 October 2011.